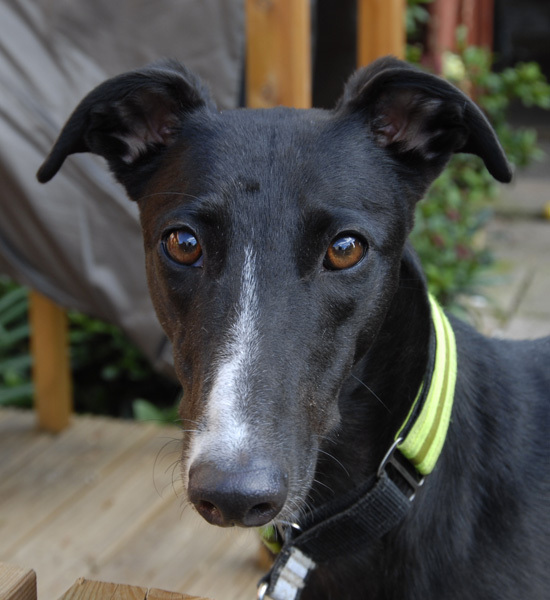 Vera is a very pretty black greyhound with a white line down her nose. She was born on the 5th November 2011, and weighs about 28k. She is a very friendly girl who has been spayed and her inoculations are being brought up to date. 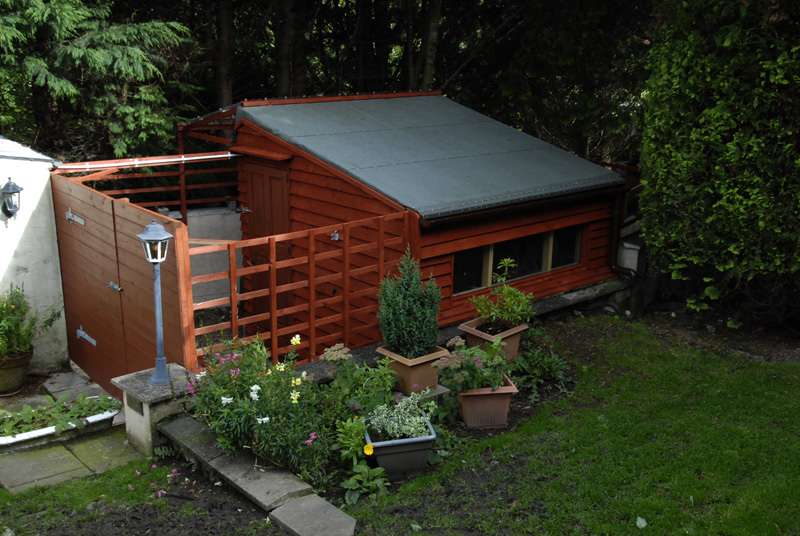 * The branch kennel at the bottom of our garden is where Vera and the other resident(s) will be for the first day or so until he gets to know the other greyhounds. He has use of our garden and paddock, and once he gets to know the other dogs he will be allowed in the house during the day and all the dogs will then take it in turn to sleep in the house at night, so they become use to sleeping in both the kennel and the house. Vera arrived this evening around 7.00pm and once she'd had a walk and sniff around the garden, done her toilet and said goodbye to her previous owner we put her in an individual kennel to introduce her to the others. This morning Vera went to the vets where she was spayed and had her first inoculation because she came with no paperwork. She weighed in at 32.2k, which is slightly larger than we thought when she arrived here. All went well and we collected her in the afternoon. All the dogs in the kennel met the ones living in the house this morning and because they got on so well together we allowed them to mingle, which they enjoyed. Vera loved mixing with the others and got on well with them. A special treat last night, all the dogs from the kennel slept in the house last night, which Vera loved, and she was as good as gold. This evening Vera's new potential owners came over to visit her and take her for a walk, so as to get to know her a bit more before they adopt her. 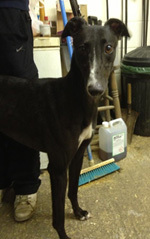 This afternoon Vera went off with her new family where we hope she will spend a long and happy life. We recceived an email later this evening letting us know that Vera has explored the garden and had a wee, explored the house, had her meal, went out and had a poo. 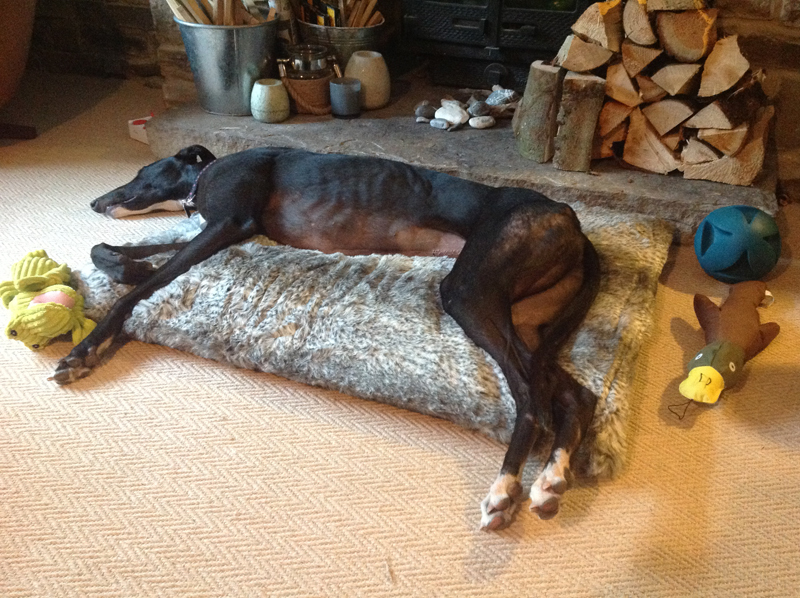 She has discovered her too-small bed, but don't worry, a bigger one will be here shortly! She has already made friends with her toys too. Vera is going to the vet's tomorrow when she will be having her stitches removed and given her second inoculation making her ready to attend her 'doggy day care' sessions for the days when both her owners are at work. We heard today that Vera will be going to the vet on Friday for her stiches out and her second inoculation. Vera is settling in very well and following her new owners around everywhere! She has slept really well both nights. They aren't going to be able to leave any food on the kitchen counter as she does love food, and their young son is currently eating with his arm around his plate, so there's going to be some training to do there! They think she may be a candidate for separation anxiety as she whines when they nip upstairs for a couple of minutes so they think they're going to have to work up very slowly to leaving her if they both need to go somewhere. They are also dreading leaving her at the 'Doggy Day Care' tomorrow because it is yet another new place for her to come to terms with. Hopefully she will be just fine there with other people and dogs around. We received an email today from Vera's new owners letting us know that Vera was a good girl having her stitches out and second inoculation. She is now very settled and happy, and her young son is very confident around her. Everyone she meets loves her and she has special permission to go into the village store with them! They are still working on the kitchen table routine and still haven't left her in the house alone, they suspect this may be a challenge, but they'll get there. Relaxing in her new home.